Now that summer is in full swing, many of us are cranking up the air conditioning in our homes in order to find relief from the heat. However, you may find that you are spending more money to control the temperature in your home during the summer months than the rest of the year. What can be done to fight these skyrocketing energy bills? Having the right Hunter Douglas window treatments in your home can actually help to cool things down and in turn, save you money on your energy bills. Don’t blast the A/C this summer – read on to find out what Hunter Douglas window treatment is right for your home! Having the right Hunter Douglas window treatments in your home can actually help to cool things down and in turn, save you money on your energy bills. Not only are Hunter Douglas Duette Architella honeycomb shades available in a huge variety of fabrics, colors, and pleat sizes, they have also been specially engineered for energy efficiency. The unique cellular shade works by trapping air in distinct pockets that not only keep your home cool in the summer, but also help to keep it warmer in the winter. Consider purchasing a lighter color for the summer, as light colors reflect light and heat away from your home, and have a second, darker color shade on hand for when winter hits. Hunter Douglas carries both vertical and horizontal blinds that can each help to reduce solar heat gain while maintaining the desired amount of light, ventilation, and privacy in your home. When white or off-white blinds are closed and lowered, you can reduce the amount of heat entering your home by up to 45 percent. Shutters are great for decoration and adding privacy to your home, but they can also help to cut energy costs as well. Closing the slats will keep the cool air in while at the same time protecting your floors and fabrics from harmful UV rays. 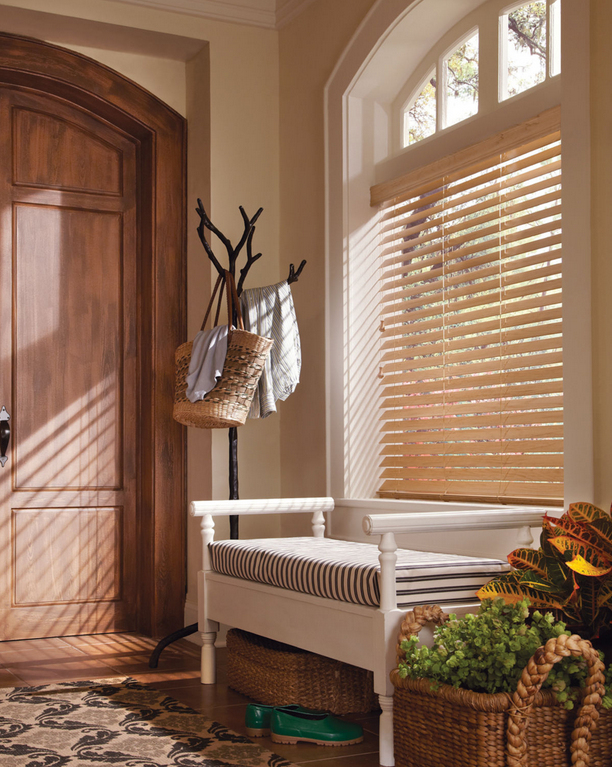 Hunter Douglas Palm Beach polysatin shutters are constructed with a UV resistant polysatin compound if you want extra protection from the sun. In search of great window treatments for your home in Howard County? From Roman shades to custom drapery, Columbia Paint can help you to discover the perfect window treatments to not only help cut your energy costs, but also to tie the whole room together. We offer custom window treatment design with a full-scale fabric library in our showroom. Choose from top-quality manufacturers including Hunter Douglas, Graber, and Kirsch. Schedule an appointment with our design consultant today.